Great events of history are over swiftly. A ball, even if it’s the first in the long and noble history of baseball to be hit for a 61st home run, takes only a few heartbeats of time to be propelled from home plate to the outfield seats. For those who were at Yankee Stadium yestrday, some 24,000 people, it was over all too quickly. It would have been better if the ball leaped in exaltation, turned int he air and wrote a saucy message (like WHEEE!) against the blue sky, dipped nobly and shed a tear over the monument to Babe Ruth in center field. …Maris swung his most vicious swing and the ball rose in a great arc toward right center field. In years to come millions will swear they were at the Stadium the day Maris hit the home run heard round the world but none among them will be able to say it was less than a perfect home run. The ball was outlined sharply, whitely, against the sky as it came to the outfield. There were puffs of white clouds in the sky but it was as though they parted to let the ball fly by. It landed perhaps six rows back, about seven seats and a narrow aisle to the right of the bullpen, well to the left of the 344 foot marker. A home run in Babe Ruth’s day, too. “I was up there wheeling,” Maris said after he had paid his homage to the commercial gods of television. He was calm, in control, the way the President is probably, when he strides into a huge room to face 800 reporters. This wasn’t the same Maris who jiggled nervously for weeks waiting for the ax to fall on the 154th game. It wasn’t the same Maris who lost sleep, even tufts of his hair in the unbearable pressure cooker of the publicity as he made the run at the 154th game home run record. 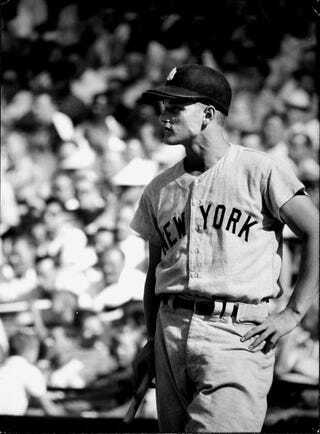 It was a Maris who seemed a foot taller now that a terrible load had been taken off him, now that he had the 61 home runs, now that the season was over. …The people got to their feet and clapped their hands as Maris ran. It wasn’t so much a cheer as it was applause, the kind you get from an audience which has been moved by a great performance. …The applause and his teammates brought him back out of the dugout, cap off, his hair looking, in the bright day, blonder than it is. He waved his cap once, twice, tried to retreat, was pushed back by the players. “I thought they wanted me to stay out there all day,” Maris said. Perhaps they, who have had to get the base hits, understand best the magnitude of Maris’ accomplishment. Put it this way. It’s difficult to hit 61 home run the way it was difficult to run the four minute mile before anybody else had done. Others may now hit 61 but you have to put Roger Maris up there with Roger Bannister. It’s been a great century for Roger.